Quem é Dr. Marcelo Vieira Netto? O Dr. Marcelo V. Netto é Doutor em Oftalmologia pela Faculdade de Medicina da Universidade de São Paulo – USP. 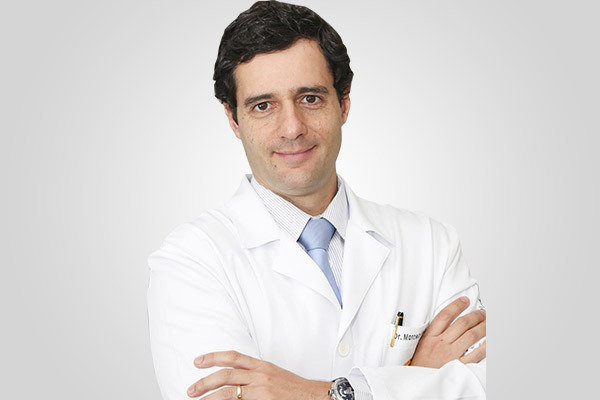 Além disso, o Dr. Marcelo foi Senior Fellow e Instrutor Cirúrgico da Universidade de Washington, Seattle, EUA.Em seguida, concluiu o PhD em Ciências Visuais pela The Cleveland Clinic Foundation em Cleveland, OH, EUA. Atualmente o Dr. Marcelo V. Netto está coordenando projetos de pesquisa no setor de córnea e cirurgia refrativa da Universidade de São Paulo (Hospital das Clínicas da Faculdade de Medicina da USP) em parceria com o IPEN (Instituto de Pesquisa e Energia Nuclear da USP) e The Cleveland Clinic Foundation, Ohio, US.Sua produção científica inclui 82 artigos científicos publicados (veja abaixo relação dos principais artigos científicos publicados em revistas indexadas), mais de 50 capítulos de livros e autoria de dois livros “Atualização Propedêutica em Cirurgia Refrativa” e “Manual de Cirurgia Refrativa do Hospital das Clínicas da USP”. Very late-onset corneal scar triggered by trauma after photorefractive keratectomy. Gomes BA, Smadja D, Espana EM, Ahn ES, Netto MV, Santhiago MR. J Cataract Refract Surg. 2012 Sep;38(9):1694-7Peripheral sterile corneal ring infiltrate after riboflavin-UVA collagen cross-linking in keratoconus. Ghanem RC, Netto MV, Ghanem VC, Santhiago MR, Wilson SE. Cornea. 2012 Jun;31(6):702-5.Mitomycin C: biological effects and use in refractive surgery. Santhiago MR, Netto MV, Wilson SE. Cornea. 2012 Mar;31(3):311-21.Modulation transfer function and optical quality after bilateral implantation of a +3.00 D versus a +4.00 D multifocal intraocular lens. Santhiago MR, Wilson SE, Netto MV, Ghanen RC, Monteiro ML, Bechara SJ, Espana EM, Mello GR, Kara N Jr. J Cataract Refract Surg. 2012 Feb;38(2):215-20.Visual performance of an apodized diffractive multifocal intraocular lens with +3.00-d addition: 1-year follow-up. Santhiago MR, Wilson SE, Netto MV, Espíndola RF, Shah RA, Ghanem RC, Bechara SJ, Kara-Junior N. J Refract Surg. 2011 Dec;27(12):899-906.Comparison of reading performance after bilateral implantation of multifocal intraocular lenses with +3.00 or +4.00 diopter addition. Santhiago MR, Netto MV, Espindola RF, Mazurek MG, Gomes Bde A, Parede TR, Harooni H, Kara-Junior N. J Cataract Refract Surg. 2010 Nov;36(11):1874-9.Optical quality in eyes implanted with aspheric and spherical intraocular lenses assessed by NIDEK OPD-Scan: a randomized, bilateral, clinical trial. Santhiago MR, Netto MV, Barreto J Jr, Gomes BA, Oliveira CD, Kara-Junior N. J Refract Surg. 2011 Apr;27(4):287-92.Wavefront analysis and modulation transfer function of three multifocal intraocular lenses. Santhiago MR, Netto MV, Barreto J, Gomes BA, Schaefer A, Kara-Junior N. Indian J Ophthalmol. 2010 Mar-Apr;58(2):109-13.Collagen crosslinking with riboflavin and ultraviolet-A in eyes with pseudophakic bullous keratopathy. Ghanem RC, Santhiago MR, Berti TB, Thomaz S, Netto MV. J Cataract Refract Surg. 2010 Feb;36(2):273-6.Wavefront analysis, contrast sensitivity, and depth of focus after cataract surgery with aspherical intraocular lens implantation. Santhiago MR, Netto MV, Barreto J Jr, Gomes BA, Mukai A, Guermandi AP, Kara-Junior N. Am J Ophthalmol. 2010 Mar;149(3):383-9.A contralateral eye study comparing apodized diffractive and full diffractive lenses: wavefront analysis and distance and near uncorrected visual acuity. de Santhiago MR, Netto MV, Barreto J Jr, Gomes Bde A, Schaefer A, Kara-Junior N. Clinics (Sao Paulo). 2009;64(10):953-60.Topography-guided (NIDEK customized aspheric treatment zone) photorefractive keratectomy with mitomycin C after penetrating keratoplasty for keratoconus: case report. Barreto J Jr, Netto MV, Reis A, Nakano M, Alves MR, Bechara SJ. J Refract Surg. 2009 Jan;25(1 Suppl):S131-5Netto MV, Barreto J Jr, Santo R, Bechara S, Kara-Jose N, Wilson SE. Synergistic effect of ethanol and mitomycin C on corneal stroma. J Refract Surg. 2008 Jun;24(6):626-32.Mohan RR, Stapleton WM, Sinha S, Netto MV, Wilson SE. A novel method for generating corneal haze in anterior stroma of the mouse eye with the excimer laser. Exp Eye Res. 2008 Feb;86(2):235-40.Medeiros FW, Stapleton WM, Hammel J, Krueger RR, Netto MV, Wilson SE. Wavefront analysis comparison of LASIK outcomes with the femtosecond laser and mechanical microkeratomes. J Refract Surg. 2007 Nov;23(9):880-7.Netto MV, Mohan RR, Medeiros FW, Dupps WJ Jr, Sinha S, Krueger RR, Stapleton WM, Rayborn M, Suto C, Wilson SE. Femtosecond laser and microkeratome corneal flaps: comparison of stromal wound healing and inflammation.J Refract Surg. 2007 Sep;23(7):667-76.Ambrósio R Jr, Jardim D, Netto MV, Wilson SE. Management of unsuccessful LASIK surgery.Compr Ophthalmol Update. 2007 May-Jun;8(3):125-41.Barreto J Jr, Netto MV, Cigna A, Bechara S, Kara-José N. Precision of higher order aberration repeatability with NIDEK OPD-scan retinoscopic aberrometry.J Refract Surg. 2006 Nov;22(9 Suppl):S1037-40.Netto MV, Chalita MR, Krueger RR. Corneal haze following PRK with mitomycin C as a retreatment versus prophylactic use in the contralateral eye. J Refract Surg. 2007 Jan;23(1):96-8.Barreto J Jr, Netto MV, Santo RM, Jose NK, Bechara SJ. Slit-scanning topography in vernal keratoconjunctivitis. Am J Ophthalmol. 2007 Feb;143(2):250-254.Dupps WJ Jr, Netto MV, Herekar S, Krueger RR. Surface wave elastometry of the cornea in porcine and human donor eyes. J Refract Surg. 2007 Jan;23(1):66-75.Li Y, Netto MV, Shekhar R, Krueger RR, Huang D. A Longitudinal Study of LASIK Flap and Stromal Thickness with High-speed Optical Coherence Tomography. Ophthalmology. 2007 Jun;114(6):1124-32.Netto MV, Mohan RR, Sinha S, Sharma A, Gupta P, Wilson SE. Effect of Prophylactic and Therapeutic Mitomycin C on corneal apoptosis, cellular proliferation, haze, and long-term keratocyte density in rabbits. J Refract Surg. 2006;22:562-574.Netto MV, Dupps W Jr, Wilson SE. Wavefront-guided ablation: evidence for efficacy compared to traditional ablation. Am J Ophthalmol. 2006 Feb;141(2):360-368.Ambrosio R Jr, Netto MV, Wilson SE. Surgery in patients with Fuchs’. Ophthalmology. 2006 Mar;113(3):503.Netto MV, Gupta P, Dupps WJr, Krueger RR, Wilson SE. LASIK with Femtosecond Laser: Analysis of our first 400 cases. Ophthalmology – Submitted 2006.Netto MV, Mohan RR, Dupps WJr, Krueger RR, Wilson SE. Femtosecond Laser versus microkeratome LASIK flaps: Morphological analysis and corneal wound healing response. Invest Ophthalmol Vis Sci – Submitted 2006.Netto MV, Chalita MR, Gupta P, Dupps WJr, Wilson SE, Krueger RR. Wavefront-guided LASIK treatment with femtosecond laser and conventional microkeratome. J Refract Surg – Accepted 2006.Netto MV, Mohan RR, Dupps WJr, Krueger RR, Wilson SE. Automated epithelial flap creation (Epi-LASIK): Morphological analysis. Exp Eye Res – Submitted 2006.Netto MV, Mohan RR, Sunilima S, Sharma A, Wilson SE. Topical Mitomycin C effect, side effects and mechanism of action in the cornea. Invest Ophthalmol Vis Sci – Submitted 2006.Netto MV, Wilson SE. Indications for excimer laser surface ablation.J Refract Surg. 2005 Nov-Dec;21(6):734-41.Netto MV, Mohan RR, Sinha S, Sharma A, Dupps W, Wilson SE. Stromal haze, myofibroblasts, and surface irregularity after PRK. Exp Eye Res. 2006 May;82(5):788-97.Mohan RR, Sharma A, Sinha S, Netto MV, Wilson SE. Gene therapy in the cornea. Prog Retin Eye Res. 2005 Sep;24(5):537-59.Netto MV, Chalita MR, Krueger RR. Topical mitomycin C for prophylaxis and treatment of corneal haze. J Refract Surg. 2006.Netto MV, Ambrosio RJr, Shen T, Wilson SE. Wavefront analysis in normal refractive surgery candidate. J Refract Surg Jul-Aug 2005;21:332-338.Netto MV, Mohan RR, Ambrosio RJr, Hutchinson A, Zieske J, Wilson SE. Wound healing in the cornea: a review of refractive surgery complications and new prospects for therapy. Cornea. 2005 Jul;24(5):509-22.Wilson SE, Netto MV. Refractive surgery and cornea: the never-ending spiral of technology. Arch Ophthalmol. 2005 Feb;123(2):265-266.Netto MV, Ambrósio RJr, Chalita MR, Krueger RR, Wilson SE. Corneal wound healing response following different modalities of refractive surgical procedures. Arq Bras Oftalmol 2005;68:140-149.Netto MV, Chalita MR, Krueger RR. Thygeson’s superficial punctate keratitis recurrence after laser in situ keratomileusis. Am J Ophthalmol. 2004 Sep;138(3):507-8.Netto MV, Ambrosio R Jr, Wilson SE. Pupil size in refractive surgery candidates. J Refract Surg. 2004 Jul-Aug;20(4):337-342.Netto MV, Wilson SE. Flap lift for LASIK retreatment in eyes with myopia. Ophthalmology. 2004 Jul;111(7):1362-1367.Wilson SE, Mohan RR, Netto M, Perez V, Possin D, Huang J, Kwon R, Alekseev A. RANK, RANKL, OPG, and M-CSF Expression in Stromal Cells during Corneal Wound Healing. Invest Ophthalmol Vis Sci. 2004 Jul;45(7):2201-2211.Netto MV, Wilson SE. Corneal wound healing relevance to wavefront guided laser treatments. Ophthalmol Clin North Am. 2004 Jun;17(2):225-231.Kim J, Netto MV. Keratoconus associated with hyperimmunoglobulin E syndrome. Cornea. 2004 Jan;23(1):93-6.Netto MV, Wilson SE. The corneal wound healing following LASIK and PRK. S Journal of Opthalmol. 2004 Jan;17(4):281-289.Wilson, SE; Netto, M; Ambrosio, RJr. Corneal cells: chatty in development, homeostasis, wound healing and disease. Am J Ophthalmol. 2003 Sep;136(3):530-6.Ambrosio, RJr; Netto, MV; Wilson, SE. Non-infectious marginal infiltrate after Lasik. J Refract Surg 2003, Mar-Apr;19(2):154-158.Netto, MV; Mansur,G; Moradillo, J;Noleto, S;Moro, F; Ambrósio, RJr. Imprecisão na medida do sulco ciliar: Estudo experimental com olhos humanos. Rev Bras Oftal 2003;6(62):324-328.Netto MV; Stephan N; Guedes, J; Komatsu F; Centurion, V; Figueiredo C. Current trends of cataract surgery in Brazil. Rev Bras Oftalmol. 2002;61(12):834-841.Netto MV, Fonseca VC, Noleto S, Muller MW. Reactivation of ocular toxoplasmosis after cataract surgery. Rev Bras Oftalmol. 61(9):640-644, 2002.Netto MV, Noleto S, Komatsu F, Guedes J, Centurion V, Figueiredo CG, Magalhäes R. Current trends of cataract surgery in Brazil – 2002. Rev Bras Oftalmol. 61(12):856-861, 2002.Netto MV, Ambrósio RJr, Moro F, Oliveira, JP, Noleto S, Cvintal T. Comparative study between topical and peribulbar anesthesia during bilateral phacoemulsification. Rev Bras Oftalmol. 61(1):43-48, 2002.Dib O, Santos RL, Netto MV, Magalhäes R, Cvintal T. Trabeculectomy preserve Tenon’s capsule integrity in cases of poor prognosis. Rev Bras Oftalmol. 61(1):19-22, 2002.Oliveira JP; Moro F, Soubhia FS, Noleto S, Netto MV. Corneal thickness evaluated by ultrasonic pachymeter and Orbscan II. Rev Bras Oftal. 2001;60(5):338-343.Netto MV, Moro F, Ambrósio RJr, Occhiutto ML, Cvintal T. Therapeutic aspects of the iris cyst. Rev Bras Oftalmol. 60(10):731-734, 2001.Moro, F; Netto, MV; Soubhia, FS; Oliveira, JPA; Ambrosio, RJr. Non-arteritic anterioVery late-onset corneal scar triggered by trauma after photorefractive keratectomy. Gomes BA, Smadja D, Espana EM, Ahn ES, Netto MV, Santhiago MR. J Cataract Refract Surg. 2012 Sep;38(9):1694-7Peripheral sterile corneal ring infiltrate after riboflavin-UVA collagen cross-linking in keratoconus. Ghanem RC, Netto MV, Ghanem VC, Santhiago MR, Wilson SE. Cornea. 2012 Jun;31(6):702-5.Mitomycin C: biological effects and use in refractive surgery. Santhiago MR, Netto MV, Wilson SE. Cornea. 2012 Mar;31(3):311-21.Modulation transfer function and optical quality after bilateral implantation of a +3.00 D versus a +4.00 D multifocal intraocular lens. Santhiago MR, Wilson SE, Netto MV, Ghanen RC, Monteiro ML, Bechara SJ, Espana EM, Mello GR, Kara N Jr. J Cataract Refract Surg. 2012 Feb;38(2):215-20.Visual performance of an apodized diffractive multifocal intraocular lens with +3.00-d addition: 1-year follow-up. Santhiago MR, Wilson SE, Netto MV, Espíndola RF, Shah RA, Ghanem RC, Bechara SJ, Kara-Junior N. J Refract Surg. 2011 Dec;27(12):899-906.Comparison of reading performance after bilateral implantation of multifocal intraocular lenses with +3.00 or +4.00 diopter addition. Santhiago MR, Netto MV, Espindola RF, Mazurek MG, Gomes Bde A, Parede TR, Harooni H, Kara-Junior N. J Cataract Refract Surg. 2010 Nov;36(11):1874-9.Optical quality in eyes implanted with aspheric and spherical intraocular lenses assessed by NIDEK OPD-Scan: a randomized, bilateral, clinical trial. Santhiago MR, Netto MV, Barreto J Jr, Gomes BA, Oliveira CD, Kara-Junior N. J Refract Surg. 2011 Apr;27(4):287-92.Wavefront analysis and modulation transfer function of three multifocal intraocular lenses. Santhiago MR, Netto MV, Barreto J, Gomes BA, Schaefer A, Kara-Junior N. Indian J Ophthalmol. 2010 Mar-Apr;58(2):109-13.Collagen crosslinking with riboflavin and ultraviolet-A in eyes with pseudophakic bullous keratopathy. Ghanem RC, Santhiago MR, Berti TB, Thomaz S, Netto MV. J Cataract Refract Surg. 2010 Feb;36(2):273-6.Wavefront analysis, contrast sensitivity, and depth of focus after cataract surgery with aspherical intraocular lens implantation. Santhiago MR, Netto MV, Barreto J Jr, Gomes BA, Mukai A, Guermandi AP, Kara-Junior N. Am J Ophthalmol. 2010 Mar;149(3):383-9.A contralateral eye study comparing apodized diffractive and full diffractive lenses: wavefront analysis and distance and near uncorrected visual acuity. de Santhiago MR, Netto MV, Barreto J Jr, Gomes Bde A, Schaefer A, Kara-Junior N. Clinics (Sao Paulo). 2009;64(10):953-60.Topography-guided (NIDEK customized aspheric treatment zone) photorefractive keratectomy with mitomycin C after penetrating keratoplasty for keratoconus: case report. Barreto J Jr, Netto MV, Reis A, Nakano M, Alves MR, Bechara SJ. J Refract Surg. 2009 Jan;25(1 Suppl):S131-5Netto MV, Barreto J Jr, Santo R, Bechara S, Kara-Jose N, Wilson SE. Synergistic effect of ethanol and mitomycin C on corneal stroma. J Refract Surg. 2008 Jun;24(6):626-32.Mohan RR, Stapleton WM, Sinha S, Netto MV, Wilson SE. A novel method for generating corneal haze in anterior stroma of the mouse eye with the excimer laser. Exp Eye Res. 2008 Feb;86(2):235-40.Medeiros FW, Stapleton WM, Hammel J, Krueger RR, Netto MV, Wilson SE. Wavefront analysis comparison of LASIK outcomes with the femtosecond laser and mechanical microkeratomes. J Refract Surg. 2007 Nov;23(9):880-7.Netto MV, Mohan RR, Medeiros FW, Dupps WJ Jr, Sinha S, Krueger RR, Stapleton WM, Rayborn M, Suto C, Wilson SE. Femtosecond laser and microkeratome corneal flaps: comparison of stromal wound healing and inflammation.J Refract Surg. 2007 Sep;23(7):667-76.Ambrósio R Jr, Jardim D, Netto MV, Wilson SE. Management of unsuccessful LASIK surgery.Compr Ophthalmol Update. 2007 May-Jun;8(3):125-41.Barreto J Jr, Netto MV, Cigna A, Bechara S, Kara-José N. Precision of higher order aberration repeatability with NIDEK OPD-scan retinoscopic aberrometry.J Refract Surg. 2006 Nov;22(9 Suppl):S1037-40.Netto MV, Chalita MR, Krueger RR. Corneal haze following PRK with mitomycin C as a retreatment versus prophylactic use in the contralateral eye. J Refract Surg. 2007 Jan;23(1):96-8.Barreto J Jr, Netto MV, Santo RM, Jose NK, Bechara SJ. Slit-scanning topography in vernal keratoconjunctivitis. Am J Ophthalmol. 2007 Feb;143(2):250-254.Dupps WJ Jr, Netto MV, Herekar S, Krueger RR. Surface wave elastometry of the cornea in porcine and human donor eyes. J Refract Surg. 2007 Jan;23(1):66-75.Li Y, Netto MV, Shekhar R, Krueger RR, Huang D. A Longitudinal Study of LASIK Flap and Stromal Thickness with High-speed Optical Coherence Tomography. Ophthalmology. 2007 Jun;114(6):1124-32.Netto MV, Mohan RR, Sinha S, Sharma A, Gupta P, Wilson SE. Effect of Prophylactic and Therapeutic Mitomycin C on corneal apoptosis, cellular proliferation, haze, and long-term keratocyte density in rabbits. J Refract Surg. 2006;22:562-574.Netto MV, Dupps W Jr, Wilson SE. Wavefront-guided ablation: evidence for efficacy compared to traditional ablation. Am J Ophthalmol. 2006 Feb;141(2):360-368.Ambrosio R Jr, Netto MV, Wilson SE. Surgery in patients with Fuchs’. Ophthalmology. 2006 Mar;113(3):503.Netto MV, Gupta P, Dupps WJr, Krueger RR, Wilson SE. LASIK with Femtosecond Laser: Analysis of our first 400 cases. Ophthalmology – Submitted 2006.Netto MV, Mohan RR, Dupps WJr, Krueger RR, Wilson SE. Femtosecond Laser versus microkeratome LASIK flaps: Morphological analysis and corneal wound healing response. Invest Ophthalmol Vis Sci – Submitted 2006.Netto MV, Chalita MR, Gupta P, Dupps WJr, Wilson SE, Krueger RR. Wavefront-guided LASIK treatment with femtosecond laser and conventional microkeratome. J Refract Surg – Accepted 2006.Netto MV, Mohan RR, Dupps WJr, Krueger RR, Wilson SE. Automated epithelial flap creation (Epi-LASIK): Morphological analysis. Exp Eye Res – Submitted 2006.Netto MV, Mohan RR, Sunilima S, Sharma A, Wilson SE. Topical Mitomycin C effect, side effects and mechanism of action in the cornea. Invest Ophthalmol Vis Sci – Submitted 2006.Netto MV, Wilson SE. Indications for excimer laser surface ablation.J Refract Surg. 2005 Nov-Dec;21(6):734-41.Netto MV, Mohan RR, Sinha S, Sharma A, Dupps W, Wilson SE. Stromal haze, myofibroblasts, and surface irregularity after PRK. Exp Eye Res. 2006 May;82(5):788-97.Mohan RR, Sharma A, Sinha S, Netto MV, Wilson SE. Gene therapy in the cornea. Prog Retin Eye Res. 2005 Sep;24(5):537-59.Netto MV, Chalita MR, Krueger RR. Topical mitomycin C for prophylaxis and treatment of corneal haze. J Refract Surg. 2006.Netto MV, Ambrosio RJr, Shen T, Wilson SE. Wavefront analysis in normal refractive surgery candidate. J Refract Surg Jul-Aug 2005;21:332-338.Netto MV, Mohan RR, Ambrosio RJr, Hutchinson A, Zieske J, Wilson SE. Wound healing in the cornea: a review of refractive surgery complications and new prospects for therapy. Cornea. 2005 Jul;24(5):509-22.Wilson SE, Netto MV. Refractive surgery and cornea: the never-ending spiral of technology. Arch Ophthalmol. 2005 Feb;123(2):265-266.Netto MV, Ambrósio RJr, Chalita MR, Krueger RR, Wilson SE. Corneal wound healing response following different modalities of refractive surgical procedures. Arq Bras Oftalmol 2005;68:140-149.Netto MV, Chalita MR, Krueger RR. Thygeson’s superficial punctate keratitis recurrence after laser in situ keratomileusis. Am J Ophthalmol. 2004 Sep;138(3):507-8.Netto MV, Ambrosio R Jr, Wilson SE. Pupil size in refractive surgery candidates. J Refract Surg. 2004 Jul-Aug;20(4):337-342.Netto MV, Wilson SE. Flap lift for LASIK retreatment in eyes with myopia. Ophthalmology. 2004 Jul;111(7):1362-1367.Wilson SE, Mohan RR, Netto M, Perez V, Possin D, Huang J, Kwon R, Alekseev A. RANK, RANKL, OPG, and M-CSF Expression in Stromal Cells during Corneal Wound Healing. Invest Ophthalmol Vis Sci. 2004 Jul;45(7):2201-2211.Netto MV, Wilson SE. Corneal wound healing relevance to wavefront guided laser treatments. Ophthalmol Clin North Am. 2004 Jun;17(2):225-231.Kim J, Netto MV. Keratoconus associated with hyperimmunoglobulin E syndrome. Cornea. 2004 Jan;23(1):93-6.Netto MV, Wilson SE. The corneal wound healing following LASIK and PRK. S Journal of Opthalmol. 2004 Jan;17(4):281-289.Wilson, SE; Netto, M; Ambrosio, RJr. Corneal cells: chatty in development, homeostasis, wound healing and disease. Am J Ophthalmol. 2003 Sep;136(3):530-6.Ambrosio, RJr; Netto, MV; Wilson, SE. Non-infectious marginal infiltrate after Lasik. J Refract Surg 2003, Mar-Apr;19(2):154-158.Netto, MV; Mansur,G; Moradillo, J;Noleto, S;Moro, F; Ambrósio, RJr. Imprecisão na medida do sulco ciliar: Estudo experimental com olhos humanos. Rev Bras Oftal 2003;6(62):324-328.Netto MV; Stephan N; Guedes, J; Komatsu F; Centurion, V; Figueiredo C. Current trends of cataract surgery in Brazil. Rev Bras Oftalmol. 2002;61(12):834-841.Netto MV, Fonseca VC, Noleto S, Muller MW. Reactivation of ocular toxoplasmosis after cataract surgery. Rev Bras Oftalmol. 61(9):640-644, 2002.Netto MV, Noleto S, Komatsu F, Guedes J, Centurion V, Figueiredo CG, Magalhäes R. Current trends of cataract surgery in Brazil – 2002. Rev Bras Oftalmol. 61(12):856-861, 2002.Netto MV, Ambrósio RJr, Moro F, Oliveira, JP, Noleto S, Cvintal T. Comparative study between topical and peribulbar anesthesia during bilateral phacoemulsification. Rev Bras Oftalmol. 61(1):43-48, 2002.Dib O, Santos RL, Netto MV, Magalhäes R, Cvintal T. Trabeculectomy preserve Tenon’s capsule integrity in cases of poor prognosis. Rev Bras Oftalmol. 61(1):19-22, 2002.Oliveira JP; Moro F, Soubhia FS, Noleto S, Netto MV. Corneal thickness evaluated by ultrasonic pachymeter and Orbscan II. Rev Bras Oftal. 2001;60(5):338-343.Netto MV, Moro F, Ambrósio RJr, Occhiutto ML, Cvintal T. Therapeutic aspects of the iris cyst. Rev Bras Oftalmol. 60(10):731-734, 2001.Moro, F; Netto, MV; Soubhia, FS; Oliveira, JPA; Ambrosio, RJr. Non-arteritic anterior ischemic optic neuropathy following phacoemulsification. Rev Bras Oftalmol 2001; 60(8):591-594.r ischemic optic neuropathy following phacoemulsification. Rev Bras Oftalmol 2001; 60(8):591-594.